Little D is turning four in March and it has me kind of questioning what to do even though I know deep down what I am going to end up doing in the long run. I received a letter in K's school bag regarding Jr and Sr Kindergarten registration, D is of age to be registered for Jr K but I think at the moment he is not ready for school. He's not ready to learn without one of us there and I think he will be starting when he's five as opposed to four. He has been doing exceptionally well, he hasn't been sick or showing any real signs for concern but I want to make sure I'm making the right decision based on signs he shows here at home like not being potty trained for one (that's a whole other post coming). He has a doctors appointment in February where I plan to discuss this further and see what she feels about his development. For those of you who are new to my blog, D was born premature by 13 weeks. Long story short he had complications with 24 hours of his birth which affected his development of his gross motor skills as a young baby. He achieved all his milestones but much later than an average baby, he seemed to have caught up until lately. More of that here. We had been warned of delays throughout his development when they found out about the complications, it could have been worse but I can't make him do something he's not ready for like school without knowing, he's going to be ok. One year can make a difference, right? If he needs to go back to see therapists and specialists at the treatment center then so be it, whatever it takes to help my little boy thrive as it always has been since the moment he was born. 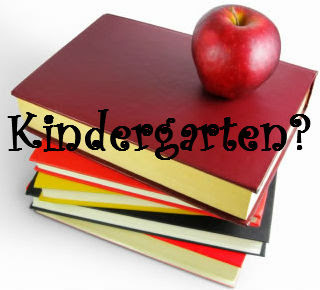 I even suggested the idea of the "Step into Kindergarten" program to hubby who thinks its a good idea to get him used to the idea once the time officially comes. That's a great program they started at K's school during the summer months before school begins. Kids, teachers and parents get together in the classroom environment to prep the kids for the first day of school! I'll be mentioning this to the doctor. It's not that I want to rush to send him off to school, I just don't want him missing out on any opportunities because I have a fear he may not be ready. The best way to find out is to see what his Doctor says and go from there. He does know what school is kind of, he sees his sister get on and off the bus and he often says "I go school too?". I always reply with an enthusiastic "Soon buddy!". I can't wait to tell him "Yes!" - his eyes light up every time that big yellow bus comes down the street. He will be on it, when he's ready. Maybe I am just worrying too much because my miracle baby is growing up. Mothers know their children better than anyone else. You will make the best decision and help your son deal with what is in store for him too. We held our daughter out of JK this year - I don't think she's ready for it yet. Large groups of kids (and by large I mean 6 or more) stressed her out, and I just didn't see the need to send her when I'm home anyway. I think you just have to trust yourself and don't be afraid to go against the norm.